Phew. I finally feel like I'm gaining ground. That overwhelmed feeling at the start of the school year has lessened. I stayed late on Friday, of course, but I feel good walking in this morning. And, most importantly, this weekend I had time to write - two blogs and time in my notebook. I also, finally, had time to read. It is amazing the difference that makes. I feel like myself again. All great books. 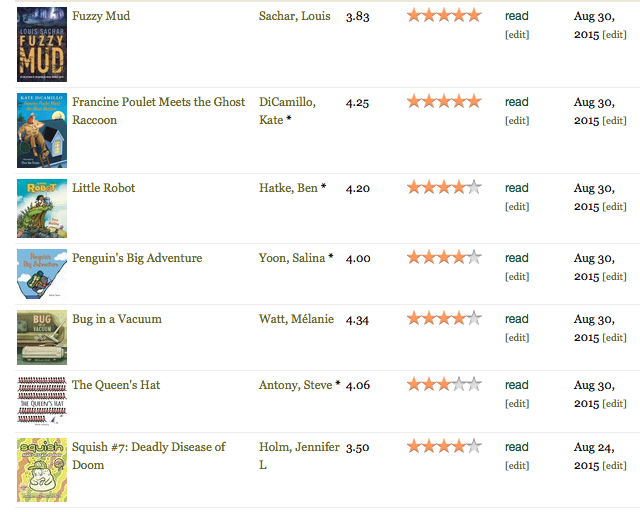 I especially loved DiCamillo's Francine Poulet Meets the Ghost Raccoon, another amazing tale from Deckawoo Drive. My students who read Mercy Watson when they were younger will be excited for the chance to revisit some old friends. I also loved Louis Sachar's Fuzzy Mud. A crazy tale of mud that has unusual properties and how it impacts a town. Also a story of friendship, bullying, and a government inquiry thrown in as well. Crazy good. The act of reflection is something I try hard to teach my fifth grade students. It is a quality they struggle with, mightily. To reflect accurately on oneself, I have learned, is something even adults don't do well. That being said, I think knowing who you are, knowing your strengths as well as weaknesses, is a powerful thing. And so, I teach it. I live in my head a great deal, I always have. I think I am my own harshest critic. At the start of my teaching career I would listen to my principal give me a glowing review and then insist he list everything I needed to do to improve. When he would look at me, puzzled, I would create my own list for him. I know very well what I am good at. I also am very aware of the many areas in which I need to grow. They are numerous. My own children have reaped the benefits of this mindset. I have pushed them since they were little to reflect on their actions, strengths, and weaknesses. They look at the world differently - Luke can focus on the negative, Liam focuses on trying to get by with the least amount of work. So, we work on that. For example, I require Luke to list positive things about people, school, his own performance before he tells me anything that is negative. While they are not perfect, they are improving. I think I am harder on them, at times, than I need to be. Because I have seen the impact of parents being unaware of who their children are and what they are truly capable of, I push mine. I need to ease up and it is through reflection that I can see that. My students so desperately need this growth too. Upon turning in an assignment, I might hand out a reflection sheet. How did they do on the assignment? What was their effort like? Could they have improved? At the start of the year I get a lot of "Great!" By the end of the year, most students can critically look at themselves, know when they mailed it in or when they truly worked their hardest. When we work in groups, I have them reflect as well. Are they contributing? Do they make the group work better by their presence or does it make the group fall apart? How can they be an asset and not a liability. I think this is a life skill our kids, and the adults in this world, desperately need. As teachers we need this too. When I began teaching my mom recommended that I reflect on each day at the end, write my reflection down on an index card, punch a hole in it, and put in on a ring. Over the year, she told me to read over those cards, reflecting on how I had grown and the work I still needed to do. It helped. Now, this blog is my index card. So is my writing notebook. Our job is such an important one. The impact a good teacher can make on a child can last a lifetime. The impact of a bad teacher can do the same. I so desperately want to make a positive impact. I want to help my students be better than they thought they could be. Meeting them, learning their stories, seeing how some of them hurt, I want to help. I carry their pain around with me, looking for a way to heal what I cannot. It is a hard job. This year I encourage you to find a way to reflect. Whether your chosen method is through writing (which I encourage), talking to colleagues, or observations of your students, you can find the spots you are already shining. You can also find the areas where you need to grow. To start off your reflection, please take some time and listen to Penny Kittle's new podcast, Stories From The Teaching Life. (HERE) What a gift she is giving us. Listening to her stories made me reflect on my own. It also reminded me of the good we do each day in this profession. I think it will lift you up and give you the energy to go in tomorrow. Reflection. What a powerful tool. Whether you have already started your school year or are just getting ready to begin, I wish you well. Let's make it the best one yet. The start of the year is always a blur. I plan, organize, prepare, and still am left in awe. Twenty years in to this career, sixteen in my district, six in this grade level, and I am still learning. Maybe when I retire I will finally figure out how on earth to get everything done I need to get done, but for now I am simply along for the ride. The first few weeks of school also coincide with football games and practices for my two boys. It is crazy. I think I am constantly driving someone somewhere, all the while thinking of what I need to do. It is the time of year where I come home from work, plop down in a chair in my kitchen, grab my laptop, and begin working again. Two hours later someone will wonder in and ask what's for dinner and I will be shocked to see that the time has passed. It is the time to remember that I will never be caught up and trying to get caught up will drive me to madness. Judging by the amount of emails, Facebook messages, Twitter messages, and Tweets I've had about the start of the year just this week, I think I am not alone in this struggle. I've had so many wonderful teachers reach out with questions, that I thought I'd address a lot of similar concerns here. Remember, we're all in this together. It gets easier. I think this is especially important for those of us that taught the same grade last year. You remember those kids that just left. How they knew to bring a notebook to the carpet for mini-lessons. How transitions and the schedule flowed. You didn't need to tell them to put their homework in the third tray for their class. For me, those kids were almost ready for sixth grade. This new group? They just left fourth. They are light years from the children that just inhabited this classroom. I have to slow down, remember. These kids will get there soon, but you have to go back. Teach the routines. It takes time. We've been in school for eight days. I think I could teach in more depth on many of these topics as our year goes on, but the students seem to have an overall grasp so far. Some were just brief lessons in passing, some were the mini-lesson for that day. We're getting there. I've had this conversation with so many educator friends of late. I think I blame it all on Pinterest. It is there to make us feel inadequate if our rooms are not adorned in chevron stripes with beautiful colors all over our room. Nope. Not going there. Years ago I had a professor at Roosevelt University named Barb Dress. She told us that if our rooms looked "finished" before school started, we were doing something wrong. She said a true classroom would have blank walls - they were waiting for student work. There would be a lack of "teacher made items" because that was pointless. There would be little to no anchor charts up because the purpose of an anchor chart was to be made with the students. I took that to heart. I'm eight days into the school year. Most of my bulletin boards are still blank. We're building our classroom together. The kids are there. Their photos are up. The room is filled with books and ugly old furniture from my house. It's a great place to be. In the past eight days I have over planned - the first week's lessons alone could take me to September. I forgot kids names. Technology has failed. Students said mean things to each other. Someone tweeted the poop emoji. I gave many Mrs. S Life Lessons speeches. I've cried in front of the kids because I was moved by their actions. I've laughed. We've had great moments and some that could have been better. Each mistake and each success go together to tell our story of our year together. But that's the good stuff. I sat in the room on the side on Friday while another teacher was in the room giving a presentation. I realized that as crazy as everything is, as much as I still need to do, I felt at peace. One of my boys glanced up from his spot on the couch and grinned at me and gave me a half wave. I think we are on the right track. The start of the year might be crazy. It might give me more gray hair than I want, but it is the building time. The relationships are being formed, the backbone of our workshop is being created, and the year has begun. I think it will be my best one yet. Deep breaths. I made it through week one of school and I haven't lost my mind. I love, LOVE, the start to the school year, but am often overwhelmed. I want my students to know everything the class that just left did. 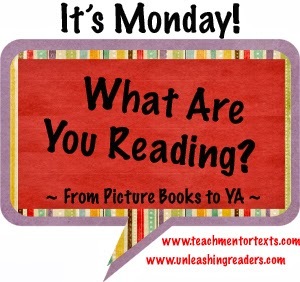 I forget that I have to teach how to check-out books using the app we use, how to Tweet, what Padlet is, how to use Google Drive, how to blog, and on and on. It seems to take forever to get where I want us to be. I think reading helped me this week. I didn't really have the time, but I made the time. It made me relax and gave me books to share with my students. It also taught my students an important lesson - even when you are busy, you can find time to read. All amazing. 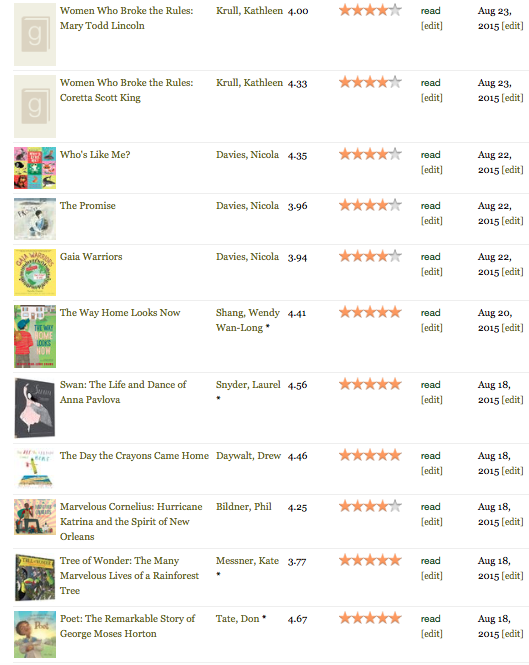 The five picture books on the bottom are five of my favorites I've read of late. The chapter book - The Way Home Looks Now - has been on my "to read" list forever and I'm now kicking myself. It is good. Really good. 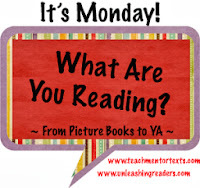 Up next - a manuscript for a friend on a professional development book and Fuzzy Mud by Louis Sachar. Have a fabulous week everyone. Happy Reading. The first week is done and I am exhausted. However, I thought joining Ruth Ayres for her weekly celebration (HERE) would help me reflect as the year begins. It never fails. Even in my 20th year of teaching, I plan far too much for the first week. Over planning is good, to some degree, but it also makes me feel that I didn’t accomplish what I wanted at the start. So, time for some reflection to realize what we did actually accomplish in the first three days together. I make relationships my focus at the start of the year. I begin with my students, sending them a letter in the mail to welcome them to class. I expand to their parents, emailing the parents in all three classes and asking them to write me about their child so I will know more as we begin our year together. I also have the kids fill out a reflection survey for me that shares their likes, dislikes, and feelings about school. I worked hard all week to get to know the 68 students I will be teaching this year. I’d say I’m getting there, but still have work to do. We began the year on the first day with homework. I think that some of them might have thought I was crazy, yet there it was. I explained that I want them to read and write daily, all year long. Usually I require 20 minutes a night for reading, 10 minutes a night for writing. This summer I decided to change that. Looking at my own reading and writing, I realized that I never read only for 20 minutes or write for 10. Some days I’m busy, and don’t get to either very much. Some days I read and write for hours. It depended on my schedule and my mood. So I asked them to make goals. I explained that 20 and 10 is a good goal, but might not be feasible every day. So maybe if one day would be super busy, read more the night before and after. So far it seems to have translated to them reading and writing more than my normal groups. We will see how that continues. Two years ago I had my homeroom students create their self-portraits with paint and we hung them around the perimeter of the classroom. I loved it. I stole the idea from Ann Marie Corgill’s brilliant book, Of Primary Importance: What’s Essential In Teaching Young Writers. Last year we didn’t make portraits. I was overwhelmed with my new schedule and couldn’t figure out how I would possibly have time to get out the paint with my homeroom kids. This year I was determined to hang up self-portraits once again. The problem was that I didn’t realize paint went bad. Opening up the paint from two years ago, I was met with globs of jelly. I briefly considered just buying more paint this weekend and then dismissed that notion and decided to have them create their portraits with markers and colored pencils. What followed was an hour of a quiet hum of conversation while we all colored and talked. My friend, Mindy, who teaches special ed in our building was up to check on some students and she joined us. At one point I looked at her and said that I wished every day could end with coloring, that I felt so relaxed and at peace. She agreed. It was amazing. I always get to know the kids better in my homeroom class. They are with me more of the day than the other two classes. I knew we had clicked at the end of the day on Friday. Kids were sprawled across the room, reading and writing with their friends. A few were sending their first tweets from our classroom Twitter account, and shouting with joy when an author or classroom Tweeted them back. I was at the front of the room, helping a few students who had come in from other classrooms to find books to read for the weekend. One of my homeroom kids, Zoe, came up, quietly asking if I would want to read what she wrote. It was the start of a story. I read it and was immediately taken with her lead. I asked if I could share it with the class. She agreed. I called out, getting the attention of the group, and read Zoe’s lead. I told them that it captivated me and wondered if anyone else felt the same. Several nodded. I asked why and they shared out the reasons. As I sat back and watched, I saw kids talking about Zoe’s writing, and then their own. Several commented on what they liked about each other’s writing. 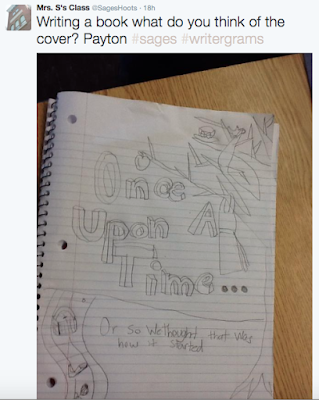 Payton showed me the cover of the story she is creating. I told her I loved it. She said she had shared it on our Twitter account to get feedback from other writers. I was impressed. head over to Twitter and reply at @SagesHoots. Thanks! We might not have gotten to everything on my plans for these three days, but we are building our community. Kids have made me laugh out loud this week from their comments and actions. I’ve also cried over students this week, wishing life didn’t have to be so hard when you are only ten. We are talking books, sharing writing, and beginning to connect to the outside world. All in all, a successful week indeed. My homeroom and I, day one. It is going to be a great year! I am a huge podcast fan. I have an app on my iPhone and subscribe to several. At first, all of the podcasts, or audio shows, I subscribed to were about teaching. I began with listening to Franki Sibberson's interviews with teachers and writers for Choice Literacy. Then, I ventured into the world of children's lit with Sara Zarr and Matthew Winner. Eventually, other interests began sneaking in - Gilmore Guys as they discussed my favorite TV show of all time, John and Hank Green's new podcast called Dear Hank and John. The newest obsessions from this summer were Start Up and Mystery Show, recommended to me by my friend, Colby Sharp. As of Monday, I added a new audio show to my line up - The Yarn. (On iTunes here.) Colby and Travis Jonker are at the helm of this show, which puts it in good hands. I've gotten to know these two guys well over the years at conferences and through Twitter. They wear many hats, not the least of which is that of a third grade teacher (Colby) and school librarian (Travis). So these two were teaming up to create a audio show? I would subscribe immediately. The concept for Season 1is brilliant. They are looking at one book from all sides. Hearing from all of the different folks that worked together to create this book. Say no more, I'm in. The book is by one of my favorite graphic novel teams - Jennifer Holm and Matthew Holm. The title? 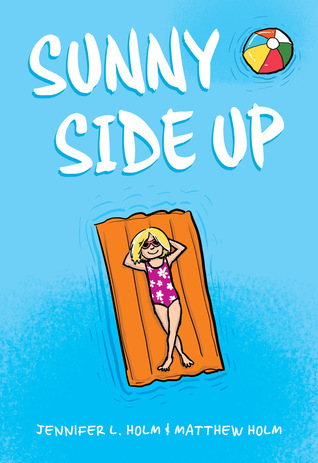 Only a book I've had on pre-order since last spring, Sunny Side Up. Seriously? How did they accomplish this? 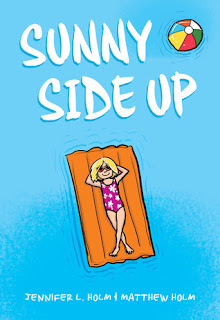 On the 25th, Sunny Side Up will finally be released. Trust me, it's good. So good I have three copies on order because one won't be enough. That kind of good. As for what's next for The Yarn? Colby and Travis haven't decided. According to their interview with Matthew Winner for his Let's Get Busy podcast (here) anything is possible. They've committed for one season, but I do so hope there is more. What a gift they have given us. Today marks my first day of school. My students will be entering our classroom in just a few hours. One of the first things I will be sharing with them is the idea of story. The importance of story. That a story can be told around a campfire, in the pages in their notebook, between the pages of a book, or as an audio story. My example? The Yarn. What a story it is. I have a feeling they will be hooked too. 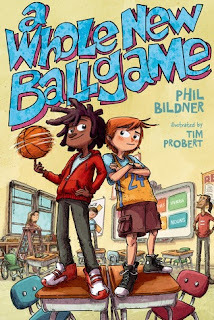 A Whole New Ballgame by Phil Bildner comes out today. I cannot tell you how excited I am for this book. Last spring I was lucky enough to receive an ARC. After book talking it to my three fifth grade classes, I had a waiting list seven kids deep...in each class. This book follows the story of Rip and Red as they begin fifth grade together. Red is on the autism spectrum and Rip, his best friend, knows how to calm him down when needed. Boy is it needed at the start of their school year. Many curve balls are thrown their way. They have a new teacher, Mr. Acevedo instead of Mrs. Hamburger like was planned. Mr. Acevedo has earrings, tattoos, believes in something called reading and writing workshop, and is just a bit goofy. I love him. This book speaks to my students. You can tell Phil knows kids, knows what makes them tick, and knows what good teaching looks like. There is so much to love about this book. I was super excited to interview Phil and find out a little more about this amazing book. Check out the interview below. What inspired A Whole New Ballgame? One thing I always tell kids – or anyone – is that you write about what you know and you write about what you love. If you write about what you know and write about what you love, and you’re passionate about it, it’s going to come through in your writing. 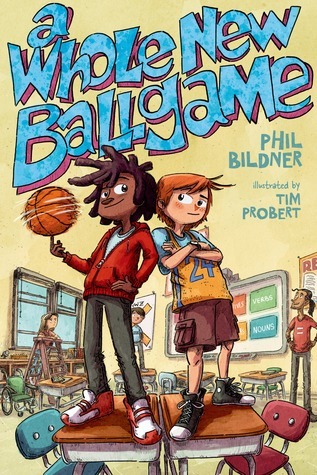 A Whole New Ballgame is all about school and sports and friendships and community and inclusion. When it comes to kids, those are my passions. On a more micro level, basketball has always been my favorite sport. But up until now, I’ve only written books about other sports – baseball, football, and soccer. Finally writing a basketball story – a basketball series -- has been super exciting. One area my students struggle in writing fiction is in regard to characters. In reading your book, I could clearly see my students in the characters, they seemed real. What advice would you give my students on developing characters that don’t seem to be flat? Developing characters can be challenging, but every student is capable of creating multi-layered characters that seem real…if you’re willing to put in a little work. Here are two things to try: First, people watch. Observe people and make up stories about them. You can be silly or serious or bizarre, but no matter what you decide, try to be as specific as possible. Come up with rich details to describe the person you’re observing. The second thing I suggest – and this is something I’ve been doing recently -- is create thought bubbles. Look at a photograph of a person or study a person while people watching and come up with their thought bubbles. Let your imagination run wild. What is that person thinking? Create his or her internal dialogue. My students are always curious about the writing process. Can you tell us about yours? I was trying to think of the one word that best describes my writing process, and the word I keep coming back to is scattered. My process is all over the place! After I write in my journal, I move the ideas to my computer. Then it’s all about revising, revising, and more revising. For instance, right now, I’m working on this middle grade novel. Over the weekend, I printed out the first seventy pages to read out loud and mark up. Let me tell you, the next time I print out the first seventy pages, it’s going to look nothing like what I printed out previously. That goes right along with something I always tell kids: The real writing takes place during the rewriting. What advice would you have for budding writers? The one piece of advice I would give to budding writers: Read! Read whatever you want. The things that interest you most – gymnastics, Minecraft, cooking, basketball, whatever – read about them as much as you possibly can. The more you read, the more comfortable you become with words. The more comfortable you become with words, the better your writing. And what’s next for Rip, Red, and Mr. Acevedo? I’m so glad you asked! Right now, we’re planning on four books in the Rip and Red series. The second one is called “Rookie of the Year.” It comes out next fall. I don’t want to give too much away, but I will tease one of the storylines: A new kid joins the Clifton United basketball team, and she is as good a ballplayer as Rip and… well, stay tuned! As I prepare to begin another school year, I feel the excitement welling up inside. Our class lists were posted this week. I poured over each of my three classes. Seeing some names that are familiar, some names that I don't know a face to tie it to, yet. I felt the flutter of excitement. Wondering what this year would bring. How long it would take to feel that amazing bond of community. Would they love reading first, or writing? Could I help them grow as much as I wanted? Where to start? When I teach, I become a story teller. I share stories I have heard about authors to help sell their books. I confide stories about when I've messed up to let my students know they are not alone. I bare my soul and tell them the fears and joys of being a parent so that they will understand their own a little better. I find stories in videos and articles online, picture books and chapter books in my room, that open up the discussion for stories of character. To try and help my students become the best version of themselves that they can. And I hope, and spend many hours praying, that they heard me. Heard any of the stories that they needed to hear. I hope that whatever story they were meant to get wormed its way into their brain and they can come back to it later. Teaching is an odd job. It reminds me of parenting in many ways. You pour all of this energy into these people in front of you for a year and hope that you helped them. Sometimes I can see that I did. A child changes in our year together. It is obvious. But often, you don't know the impact you've made. Like parenting, it is seen years later. And that can be tough. I'm one of the lucky ones. In a town the size of mine, I see these kids from the moment they enter into my class through their graduation from high school. I don't see them daily, of course, but I can visit with them on and off through the years. I watch them go through middle school as they work on figuring out who they are. Then they move on to high school and find groups of friends that celebrate them. They start to make plans for the future, thinking of what they want to become. I watch them graduate, grins stretched across their faces, tears in the eyes of their parents, and I marvel at how quickly time has passed. It is incredible. But because I am here, I also get to see the impact that the teachers in their lives have made. My former students will share. Through emails, messages on social media, conversations when passing in the street, they tell me. Good and bad, we make an impact. They remember the kind teacher in Kindergarten who dried their tears when they wanted to go home. The gruff teacher in the middle grades who made them realize they were being lazy. The teacher in high school who inspired them by their passion for the subject. That made them have the desire to major in it themselves in college. This is not a role I take lightly. We will be remembered, and we get to choose what that looks like. Long ago, I made that choice. I knew I wanted my students to remember me as a teacher that cared who they were, a teacher who believed in them, a teacher who thought reading and writing were important because it makes us more aware of ourselves and the world around me. So, I tell stories. I bare my soul. I cry with my students, laugh with them, hug them, and go home and cry for the ones I can't reach. It is hard. This week I got to see the names of the sixty-eight kids I will be spending the next school year with. I also hugged a former student who was starting her senior year. Spoke words of confidence to several students getting ready to begin middle school. Sat on my front porch and talked to boys who I taught a few years ago. Exchanged emails with students who were heading to high school. In each exchange, I was blessed to see the impact that we make. It wasn't always visible in the year I had with them, but in hindsight, I can see it. As you prepare to start another year with the students who will fill up your classroom, I encourage you to take a moment and think of the impact you will make. You might not see the results of your work this year, but they will be there. Speak to their hearts. They are waiting to be filled up. Have a wonderful school year. The end of summer seems like a race to the finish. School begins on the 19th for us. Teachers report back on the 17th. Likely, I will only have the afternoon of the 17th in my classroom to get ready. The rest of the time is taken up by meetings. Having the room ready by the 18th in the afternoon is tough. Students are allowed to come in with their families then to see their classrooms and meet their teachers. So this week? It is the marathon and I am exhausted. No matter how much you work, it never feels like enough and there is always, always, something more you could do. Last week I mailed off the "Football Field" letters. (More on what those are HERE.) This week I mailed letters to my new students. It really reminded me of the cyclical nature of teaching - saying goodbye, and then saying hello. It made me mourn for my students who have left, but feel excitement over the class that is to come. 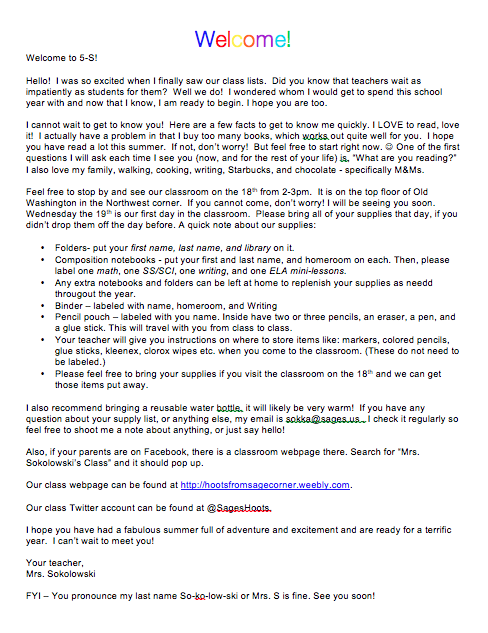 Some folks on Twitter and Facebook asked if they could see my letter to my students. I don't think it is anything fabulous, but I send a variation of this home each year. Last year I shared a video tour of my classroom on this blog. Many people commented that it was helpful and last week I began to get messages to see if I could do it again. There isn't a whole lot of change from last year, but I did do an updated video if that helps. I love checking out other classrooms, so I'm glad to let you all into mine. One quick tip that I'm not sure if I have ever mentioned - my bulletin board are painted. (Regular paint and a roller) I abhor cutting the bulletin board paper, getting it up, etc. I went with a calm color, the same on all boards, and it has held up for five years so far. Wishing you all the best school year yet! Thanks for visiting. This book packs an emotional punch. A quiet book, but one that speaks right to your heart. In other words, my kind of book. Ruby is eleven and just getting ready to start middle school. Like many middle school students, Ruby thinks about friendships quite a bit. But in Ruby's world, it is different. She has always kept a distance from other kids. Been friendly, but not too friendly. She doesn't have anyone over, doesn't confide, because Ruby has a secret, her mother is in prison. Ruby's aunt knows, of course. Ruby lives with her. But no one else. And then, a new girl named Margalit moves to their apartment complex and Ruby begins to wonder if it is time to share her secret. She wonders if Margalit can be the true friend she has been looking for. I loved this book so. Ruby is introspective. She is kind, caring, and wants so badly to have a friend. She misses her mom in a way that is hard, but true. I think so many of my students will find someone to root for in Ruby. 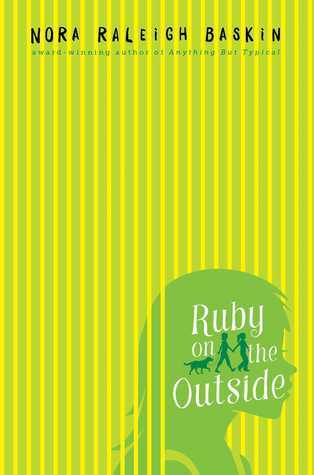 I cannot wait for school to begin so I can introduce my new class to Ruby, to share that I love it so much, I've included it in our Mock Newbery books. It's that good. What a simply beautiful book. Human Body Theater by Maris Wicks was amazing. Incredibly detailed and informative, I learned so much from this book. Each chapter is a different system in the body and the narrator, a skeleton, teaches you about it. If you plan on having it in your classroom library, just a heads up that the reproductive system is included. Would not prevent me from having it, but you should read it to be aware. 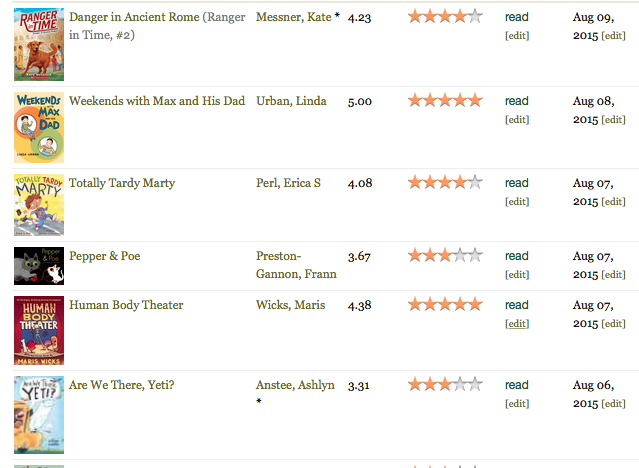 Danger in Ancient Rome (Ranger in Time #2) this is such a fun series from author Kate Messner. In Ranger #1 we followed Ranger as he helped rescue people on the Oregon Trail. In Ranger #2 we get to travel to Ancient Rome and a gladiator training school. What a fabulous series. Weekends With Max and His Dad is an amazing new series by Linda Urban. I will try and review it closer to the release date this spring because I loved it a lot. To summarize quickly, Max is a third grader who is going to visit his dad's apartment for the first time. His mom and dad have separated or divorced and his dad has found a new place. The book follows the adventures and relationship Max and his dad have on their weekend visits together. I absolutely loved Max, his imagination, and watching his relationship with his dad strengthen as they found their new roles. This is a book, and a character, many students will identify with. The Life-Changing Magic of Tidying Up - I'm working very hard to rid my house of clutter. It feels good to start the school year relatively organized. The Game of Love and Death - which I am reading with some friends to discuss this week. when something wonderful comes your way. You will want to keep him. Your Alien is written in the second person. It reminds me a lot of the style of If You Give A Mouse A Cookie... and for that reason alone, kids will love it. What they will be draw to even more, however, is the friendship story. The boy at the start sees a spaceship crash. Upon checking out the site of the crash, he meets an alien. 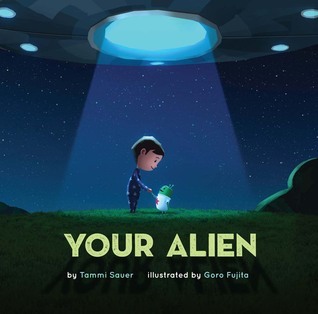 They become fast friends and spend a day together playing, until the alien becomes homesick at the end and needs to find a way to return to his parents. 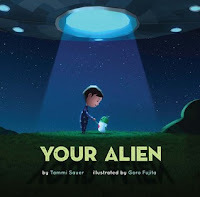 I enjoyed the lyrical nature of the text, the friendship between the boy and the alien, and the way the boy solved the problem at the end. I love how the text was circular and came back to the lines, "you will be looking out your window when something wonderful comes your way..." at the end. A beautiful story or, as the back of the book says, "A friendship that is out of this world." Super fun book that I can't wait to share with students this fall. It’s no secret; I’m a big fan of the book Little Elliot, Big City. I reviewed it HERE and also revealed some cover art from the upcoming book, Little Elliot, Big Family HERE. I love this little elephant and his kind nature. I was beyond excited to find that Merry Maker’s released Little Elliot stuffed animals. (HERE) I will absolutely be purchasing one for my classroom and one for my niece. They are adorable. All of this is to say, I got really excited when the folks at Live In A Story (website HERE) contacted me. They have wall decals that are taken right off the pages of our favorite picture books. What??? They wondered if I’d like to preview what they have for Little Elliot. Sign me up. Just a few days later, Elliot arrived. I opened the package with anticipation, unrolled it, and there he was. I immediately knew where I wanted to put him in my classroom. We start school in just over a week, so I’ve been in the classroom quite a bit. There is a spot in our classroom meeting area that I used to use for lunch count, but now was bare. It is on a white board, just to the right of our Interactive whiteboard. I put Elliot there thinking we could put speech bubbles or thought bubbles near him throughout the year. There were also fun decals with cupcakes on them that I haven’t gotten the chance to put up yet, I think I’ll place them randomly on the board around Elliot. The folks at Live in A Story wanted me to offer up one free Little Elliot wall decal along with a copy of Little Elliot, Big City to a reader of the blog. Would you like Elliot in your classroom or even your home? Fill in the Google Form below. The giveaway will be open from 8/7 through midnight on 8/10.